The Kentucky Derby is a Grade I stakes race for three-year-old Thoroughbreds, held annually in Louisville, Kentucky, on the first Saturday in May, capping the two-week-long Kentucky Derby Festival. The race is one and a quarter miles at Churchill Downs. The race is known in the United States as "The Most Exciting Two Minutes In Sports" or "The Fastest Two Minutes in Sports" for its approximate duration, and is also called "The Run for the Roses" for the blanket of roses draped over the winner. It is the first leg of the US Triple Crown The Kentucky Derby has been run every consecutive year since 1875. 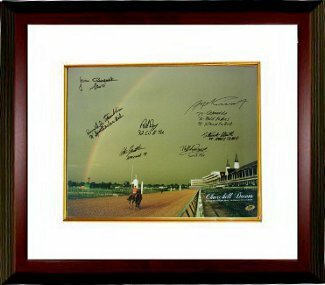 This Churchill Downs Kentucky Derby Rainbow 16x20 Photo has been signed by 9 Past Winners (7 Jockeys) each with the Date Won and the horse they rode. Jean Cruguet - Slew 77; Ron Franklin - 79 Spectacular Bid; Steve Cauthen - Affirmed 78; Pat Day - 92 Lil E Tee; Angel Cordero - 74 Cannonade, 76-Bold Forbes, 85 - Spend The Buck; Laffit Pincay - Swale 1984 and Stewart Elliott - 04 Smarty Jones. MAB Hologram and Certificate of Authenticity from Athlon Sports. Custom White Mat and Premium Mahogany Color Framed as shown.